CURTIS R. WALTON and ANDREA D. WALTON vs. LAWRENCE G. PLUMER, EDWARD M. PLUMER and CARY PLUMER. Curtis R. Walton and Andrea Walton, husband and wife, of Newbury in the County of Essex, the plaintiffs, bring this complaint to resolve a dispute with their neighbors, Lawrence G. Plumer, Edward M. Plumer and Cary Plumer, also of said Newbury, over the location of their common boundary line. As is unfortunately so frequently the case, it was the use of the common driveway located in the area of the disputed boundary which, despite years of peaceful prior usage, was at least the superficial reason for this dispute between neighbors. Since neither the plaintiffs nor the defendants knew the exact location of the common boundary, each hired a surveyor. The plaintiffs now argue on the basis of their survey that they were dispossessed of a portion of their lot when the defendants extended and expanded the westerly terminus of the common drive. The defendants, in reliance on their survey, deny having occupied their neighbors' land and claim that the common boundary runs along the southerly side of the common drive and that the drive itself is therefore entirely on their lot. In the event that the Court should otherwise locate the common bound, the defendants claim title by adverse possession to the area of and beyond the driveway extension which they have recently installed. A trial was held at the Land Court on August 19, and on August 25, 1987 at which a stenographer was sworn to record and transcribe the testimony. Twenty-one exhibits were admitted into evidence, several having multiple parts, and one chalk was provided for the Court's assistance. All exhibits entered into evidence are incorporated herein for the purpose of any appeal. Twelve witnesses testified over the two days of trial including all five of the parties; the plaintiffs' surveyor, Joseph Esposito; the plaintiffs' title examiner, Domenic S. Terranova; the defendants' surveyor, Paul Donohoe; the defendants' title examiner, Harold Morley, Jr.; a neighbor, Lillian Noyes; a friend of the defendants, Reagh Atkinson, and John D. Hartnett, Jr., a paving contractor. A view was taken by the Court on September 16, 1987 in the presence of counsel. There is attached hereto as Exhibit A a reduced copy of the plan prepared for the defendants on which three versions of the common boundary line as computed by the surveyor are shown: that which he thought consistent with the deeds in the defendants' chain of title and two others claimed by the respective parties. 1. The plaintiffs, Curtis R. Walton and Andrea D. Walton, are the record owners, as tenants by the entirety, of the property known and numbered as 10 High Road [Note 1] in Newbury, Essex County, by virtue of the deed of Edwin R. Hathaway (Mrs. Walton's uncle), dated December 7, 1973 and recorded with the Essex South District Registry of Deeds in Book 6035, Page 743 [Note 2] (Exhibit No. 2). Back title reference in this deed is made to the deed of Ada W. Kent to Charles L. Adams dated March 30, 1916 and recorded in Book 2325, Page 321 (Exhibit No. 9) and to the Estate of Edith D. Adams, Essex Probate No. 250047. The plaintiffs' deed also contains the following recital: "Subject to and with the benefit of easement referred to in deed of Ada W. Kent to Charles L. Adams, above-mentioned." Edith D. Adams was Mrs. Walton's great-great-aunt. Commencing at the Northerly corner thereof on High Street by land now or formerly of Kent at a point 67 feet Northwesterly, measuring on said street, from land of Perkins, formerly land of Edmund C. Colman; thence running SOUTHEASTERLY by said street, 67 feet to said land of Perkins; thence SOUTHWESTERLY by said land of Perkins on two courses, 353.76 feet, more or less, to a corner; thence NORTHWESTERLY by said land of Perkins, 37 feet to land now or formerly of Kent; thence on a straight line by land now or formerly of Kent; 345 feet, more or less, to the point of beginning. This description is the same as that set forth in the above-mentioned deed to Charles L. Adams (see Exhibit No. 9). 3. The deed from Ada W. Kent to Charles L. Adams not only created the plaintiffs' lot from a larger parcel which she owned, but it also conveyed a right of way to the grantee as follows: "Together with the right to use in common with the grantor, her heirs and assigns, a strip of land eight feet wide extending along the Northwesterly side of the granted premises Southwesterly from said street one hundred sixteen and 5/10 feet, which the grantor hereby lays down as a private right of way." The parties do not dispute their respective rights to use this right of way in common, only whether it is aligned with, or bisected by, their common lot line and on which side of the line it lies. 4. The defendants, Lawrence G. Plumer, Edward M. Plumer and Cary Plumer are the record owners, as joint tenants, of the property known and numbered as 8 High Road in Newbury, a small portion of which lies in Newburyport, Essex County, which was Ada W. Kent's remaining land after the conveyance to Adams, by deed of Edward M. Plumer and Cary Plumer, husband and wife, dated September 21, 1984 and recorded in Book 7535, Page 530 (Exhibit No. 8). The title reference set forth in this deed is the deed of Louise N.P. Osgood to Edward M. Plumer and Cary Plumer dated July 8, 1960 and recorded in Book 4683, Page 290 (Exhibit No. 11M). Both deeds contain the same description and recite the following encumbrance: "Subject to a right of way 8 feet in width running WESTERLY from High Street along the NORTHERLY boundary line of land of said Edith D. Adams for the distance of 116 and 5/10 feet, for the common use of the owners of the said Adams lot and the owner of the granted premises." 5. The deed of Louise N. P. Osgood to the defendants repeats the description given in the deed to her from Ernest Foss, Executor of the Estate of Ada W. Kent, dated May 9, 1934 and recorded in Book 2993, Page 81 (Exhibit No. 11L; also see sketch plan by Foss, Exhibit No. 17). This is the first description of the defendants' lot given after the conveyance out of the plaintiffs' lot by Ada W. Kent in 1916. Both this deed and the deed to the plaintiffs' predecessor, Charles L. Adams, describe the common bound as being three hundred forty-five (345) feet in length. The deed of Ernest Foss, Executor, also describes the right of way in the same language thereafter faithfully repeated in later mesne conveyances down to the present owners: "along the Northerly boundary line of land of said Edith D. Adams..."
6. The deed of Ada W. Kent which created the plaintiffs' lot gives the frontage on High Street as sixty-seven (67) feet, the southerly boundary with land of Perkins, formerly of Edmund C. Colman (now of Barton) as running "Southwesterly ... on two courses three hundred fifty three and 76/100 feet, more or less, to a corner". The westerly boundary is given as thirty-seven feet to the westerly terminus of the common boundary with other land of the grantor (now the land of the defendants). 7. Both the plaintiffs' and the defendants' surveyors found two iron pins which appear to define the plaintiffs' frontage on High Road although the defendants' surveyor measured sixty-six and 33/100 (66.33) feet and the plaintiffs' surveyor measured sixty-five and 90/100 (65.90) feet. 8. The two surveyors differed, however, as to how the boundary then should run from the iron pin at the southerly side of the drive at High Road which appeared to mark the northerly end of the plaintiffs' frontage on the street. The plaintiffs' surveyor, relying upon the plaintiffs' southerly boundary with the land of Augustus J. Barton, Jr. and Mary P. Barton, as surveyed in 1975 by Port Engineering Associates ("Port Engineering") (Exhibit No. 3), upon the plaintiffs' deed which describes their westerly boundary as thirty-seven feet and also upon the 66 foot distance between the pins on the highway, then ran the boundary line here in dispute from the pin found on the southerly side of the common drive to an iron pipe found thirty-seven and 39/100 (37.39) feet northerly from a stone bound found at what he delineated as the southwesterly corner of the plaintiffs' lot with land of Barton. This approximately thirty-seven foot distance between the iron pipe and stone bound found, in the opinion of the plaintiffs' surveyor, matched the description of the westerly boundary given in the deed of Ada W. Kent to Charles Adams. This location of the common boundary between land of the plaintiffs and defendants bisects the common drive (See "Line Claimed by Walton" on Exhibit No. 16, a portion of which is attached hereto as Appendix A). The defendants' surveyor testified at trial that the iron pipe found some thirty-seven feet northerly of the two stone bounds found at the southwest corner was not given in any of the deed descriptions. Both surveyors found two stone bounds at the southwest corner of the land of the plaintiffs at the land of the Bartons within two feet of each other, one of which was believed by both to be newer and set by Port Engineering when the Barton land was surveyed in 1975 (Exhibit No. 3 and see detail in Exhibit No. 16). 9. The defendants' surveyor did not rely on the Port Engineering plan but, following the deed descriptions in the Walton chain arising from the first description in the deed from Ernest Foss, placed the eight foot right of way northerly of the common boundary and ran a line from the same pin on the southerly side of the right of way at High Road along the southerly edge of the way to the older of the two stone bounds on the westerly boundary (See "Line Claimed By Plumer" on Exhibit No. 16 and Appendix A). This orientation of the common boundary would, however, mean that the westerly bound of the plaintiffs' lot was a point rather than a line, and thus this interpretation directly conflicts with the grant from Ada W. Kent. This, of course, is the result only if the plaintiffs' line with the Barton land is accurate as surveyed by Port Engineering, and I find and rule that it is. 10. Conversely, if the approximately thirty-seven foot dimension of the westerly boundary claimed by the plaintiffs between the two stone bounds and the iron pipe is held, the length of the defendants' western boundary will be reduced from that given in their deed. In the deeds of Ernest Foss and Louise N. P. Osgood, the defendants' predecessors in title, this dimension is given as two hundred thirty-eight and 88/100 (238.88) feet, whereas the survey done for the defendants shows this distance to be two hundred nine and 67/100 (209.67) feet. This would not, however, be the only such discrepancy between the distances so given in the defendants' chain (the Foss and Osgood deeds) and the survey done for them although it would be one of the largest. For example, the next distance given by the Foss deed after the westerly boundary is one hundred fifteen and 83/100 (115.83) which is shown on their survey as one hundred eighteen and 79/100 (118.79) feet. The next four courses given in this northerly boundary with the land now of the Society for the Preservation of New England Antiquities are given in the deed as: 33 feet, 103 feet, 78.5 feet and 37.66 feet. These distances as surveyed for them are respectively: 31.3 feet, 100.96 feet, 78.23 feet and 36.96 feet. I find and rule that none of such discrepancies is crucial, and is only such as might be expected under the circumstances. 11. The discrepancy in the defendants' frontage along High Road is the most remarkable, being given in the deeds in their chain of title as one hundred seventy-three (173) feet and measuring one hundred six and 98/100 (106.98) feet as surveyed, and as to this error there can be no question. The title examiners for both parties did concur that the frontage discrepancy may be attributed to the failure of the original common grantor, Ada W. Kent, or her executor, Ernest Foss, to subtract the lot conveyed out to the plaintiffs' predecessor in title. The profusion of inaccuracies in the Plumer chain, however, leads to the inescapable conclusion that the draftsman of the deed out had insufficient tools for his task. In the deeds in Ada Kent's immediate chain of title (Exhibit Nos. 11J, 11I) the total frontage dimension given for both lots then in single ownership was two hundred forty-one and 56/100 (241.56) feet. When the sixty-seven feet of frontage conveyed by Ada Kent to plaintiffs' predecessor Charles L. Adams is subtracted from this total frontage figure, the result, one hundred seventy-four and 56/100 (174.56) feet, is close to the dimension of one hundred seventy-three (173) feet given in the deed of Louise N. P. Osgood. Both surveyors, however, found the defendants' frontage on High Road to be slightly more than one hundred feet (107-110 feet) which, when added to the plaintiffs' actual frontage of sixty-six feet, gives a dimension of about one hundred seventy-three. Thus it appears likely that the total frontage figure of two hundred forty-one and 56/100 (241.56) feet relied upon by Ernest Foss was erroneous and was derived from the deeds in to Ada Kent (Exhibit Nos. 11I, 11J, 11K). This same type of error in the actual dimensions of Ada W. Kent's original holding may also account for any discrepancy between the deed description and the distance as actually surveyed for the defendants' westerly boundary. 12. The terrain of the land of the parties is unusual. Both properties drop steeply in elevation in the area just past the barn on the defendants' land. There is a steeper grade on the latter, perhaps due to driveway fill. There is a newly paved section which constitutes an extension of the driveway and a small parking area. Beyond this, or more accurately, at its edge there is a retaining wall and then a very sharp drop to a lower level which is sometimes a wetlands. Behind the plaintiffs' house and westerly of the plaintiffs' back yard where there is a stockade fence also running westerly, the ground descends gradually without quite as steep a drop as the area beyond the new parking area. The fence is shown on the plan. In said wetlands area there is a small muddy pond just westerly of the area marked "garden not in use" on the plan (See Appendix A), and beyond it the terrain rises again to a wooded ridge. The Plumers had cleared out the depressed area in the rear from time to time burning the brush if the area was not too wet and recently had stumps removed by a backhoe. In recent years, trucks delivering wood and glass to Lawrence Plumer's woodworking operation have used the driveway. A dispute arose over the existence on the Plumer site of this home industry and the plethora of traffic soured the previous friendly relations between the parties and their family members who had co-existed for many years. 13. The defendants claim title to the disputed area by adverse possession if the Court does not find that the record title places the line as claimed by them. The defendant Edward Plumer has been familiar with the properties since he was twelve years old (about 1934) when his aunt owned the Plumer house. He remembers his aunt giving the rubbish collector permission to cut hay for his horse from the whole back area. Over the years members of his family have parked in the driveway, and the Waltons' predecessors in title did not although, of course, they used the driveway for access to and egress from their yard. The owners from time to time of the Walton house also maintained a split rail and stockade fence along the same approximate location as at present. For about two years Mrs. Plumer planted flowers in the garden area, but it basically was too wet for this practice to continue. The placement of the plaintiffs' land on the ground depends in turn on the location of the abutting land of Barton. Since the deed out to the plaintiffs' predecessors was first in time, it controls. See G.L. c. 183, §4. While there may have been some inaccuracies in the Port Engineering survey of the Barton land, it appears to be fundamentally sound and to follow the deed descriptions in both the Barton and Walton chains. The Port survey lays out the Bartons' northerly boundary by two courses for a total distance of three hundred fifty-three and 08/100 (353.08) feet as shown on the plan entitled "Plan of Land in Newbury, Mass. - Owner Augustus J. & Mary P. Barton" dated January 15, 1975 and recorded in Plan Book 133 as Plan 86 (Exhibit No. 3). The deed of Kent to Adams describes this boundary by two courses (without giving directions therefor) for an approximate distance of three hundred fifty-three and 76/100 (353.76) feet. The most recent conveyance of the Barton land by deed of William F. Hayes to Augustus J. Barton, Jr. and Mary P. Barton, dated October 15, 1937 and recorded in Book 3126, Page 553 (Exhibit No. 12G) gives their northerly bound with the plaintiffs' land described as "formerly of Tilton" by three distances: (1) approximately one hundred fifty-six and 50/100 (156.5) feet running easterly (given as nine rods, twelve links), (2) approximately one hundred ninety-five and 50/100 (195.5) feet "continuing a little more Southerly" (given as nine rods, nine links and two rods, seventeen links) for a total distance of three hundred fifty-two (352) feet which nearly matches the Port Engineering	layout both by distance and by alignment although the courses are inexact. 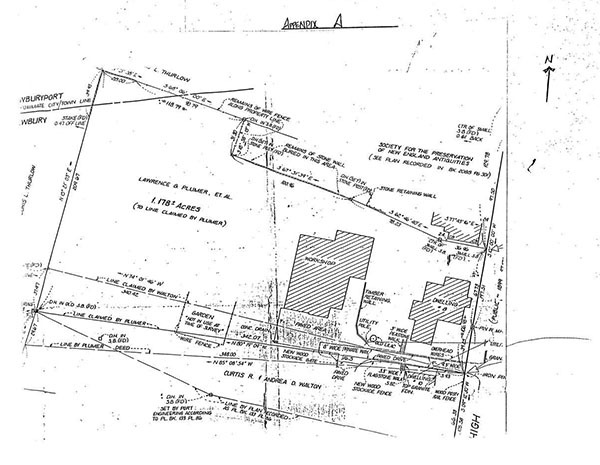 The defendants' surveyor, Mr. Donohoe, testified that these deed descriptions were not accurately laid out by Port as they do not follow the courses as so described. There also was testimony by Mr. Donohoe that the Barton and Walton houses were about thirty feet apart and several witnesses corroborated what was evident on the view: that there is a row of trees between these two homes including one oak of considerable age which may be some evidence of the fence referred to in the early deeds in the Barton chain. (See Exhibit No. 12A). Cf. Fulgenitti v. Cariddi, 292 Mass. 321 ,	325 (1935) (practical construction of some weight). A series of deeds in the Barton chain were introduced as Exhibits 12A-12G and the description of that section of the northerly boundary which now adjoins the plaintiffs' lot is described in all the deeds of this chain (See Exhibit Nos. 12C and 12E) as along land of Tilton by the same description as in the deed from Hayes to Barton. The sole exception to the repetition of this description in this chain of title as admitted into evidence is the deed of Edwin T. Chase to Edmund Coffin Colman dated February 16, 1878 and recorded in Book 995, Page 176 (Exhibit No. 12A) which gives said bound as: "easterly by said Tilton's land on different courses as the fence stands twenty one rods and thirteen links," which is a distance of approximately three hundred fifty-five (355) feet. Since I have accepted the Barton boundary line as depicted in the deeds in that chain and as shown on the Port Engineering plan as being reasonably accurate, I accept plaintiffs' placement of their line as shown on Exhibit No. 16, and I find and rule that they have record title to the premises bounded and described as follows: easterly by High Street 66.33 feet; southerly 196.20 feet and southwesterly 156.88 feet by Lot A as shown on a plan entitled "Plan of Land in Newbury, Mass. Owner Augustus J. & Mary P. Barton" dated January 15, 1975 by Port Engineering Associates, recorded in Plan Book 133, Plan 86; westerly by land now or formerly of Doris L. Thurlow 37.47 feet; and northeasterly by land of the defendants shown as "line claimed by Walton" on the plan 340.42 feet. The existence of the eight foot right of way is not an obstacle to this conclusion. When it was created, it was described as "a strip of land eight feet wide extending along the Northwesterly side of the granted premises Southwesterly from said street". This is the language which controls as the first deed out is constructive notice to all, not only as to the description but as to the way as well. The language does not use the grant as a boundary but merely describes the location of the driveway. It certainly is ambiguous as to whether the right of way is located on the Walton or Plumer side of the boundary line, although the more natural construction of the language is that it was originally on land of the defendants. It is not a monument, however, and it does not control the placement of the common line. As the driveway presently exists (and over the years, it may well have varied) it crosses the line as claimed by the Waltons, shown on the plan and now adopted by the Court. Each party has a right to use the driveway, and such use must be consistent with the rights of the co-owner. Moreover, its use must not be overburdened. The defendants' argument that they have nevertheless title to the area beyond the plaintiffs' turn-off into the plaintiffs' back yard by adverse possession, fails as there is no evidence of exclusive use. There are several conditions which must be met before title by adverse possession can be established; one of these is the requirement of exclusive possession which is lacking here. Holmes v. Johnson, 324 Mass. 450 , 453 (1949); Ottavia v. Savarese, 338 Mass. 330 , 333 (1959). Mrs. Walton testified that, prior to the extension of the drive beyond its former terminus at or about the one hundred sixteen and 50/100 (116.50) foot grant, she and her husband would park at the end on their side of the drive. While there was testimony, and visible signs on the view, of a garden beyond the end of the drive it remained unclear as to who had initially created it. It appeared that, as neither party was certain of the exact location of the common boundary, their uses of the area in dispute may have overlapped. Thus, adverse possession is no bar to alignment of the common boundary so as to bisect the drive. [Note 1] High Road is also referred to as High Street in several of the deeds and plans which are in evidence. [Note 2] All recording references herein will be to this particular registry unless otherwise indicated.